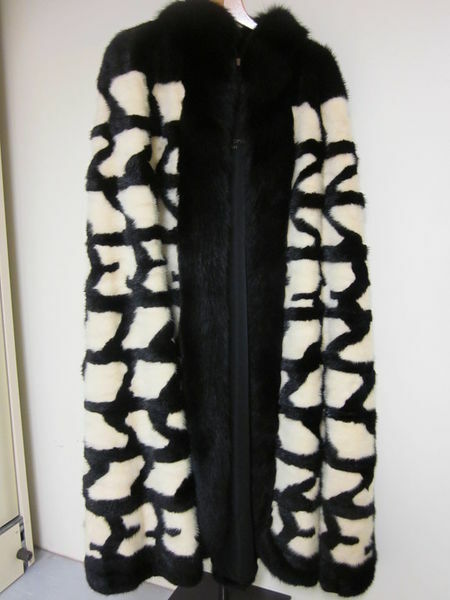 Fur cape of white mink, black-dyed musquash and black-dyed blue fox, with the Pirelli tyre-track design, white tracks against black. Velvet. Registered File number 1985/1213. Featured on the Pirelli Calendar, 1985, for November. Modelled by Iman, photographed by Norman Parkinson. Art direction by Martyn Walsh. 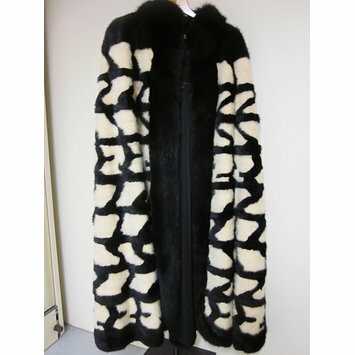 Fur cape of white mink, black-dyed musquash and black-dyed blue fox, designed by Maxwell Croft, England, 1984.